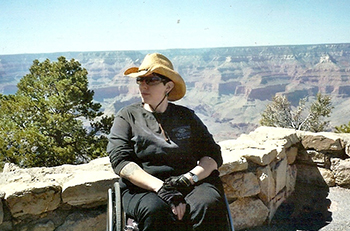 Michelle's journey started in 2007 when she started experiencing lower back pain. 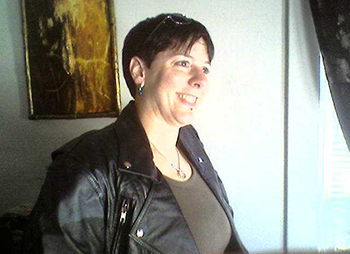 At the time, Michelle lived in Oakland, CA, and was working in a spa as a massage therapist. She visited her primary doctor and they thought it might be work related, so Ibuprofen and exercise were prescribed. The pain started to cause sciatic nerve pain and she lost the feeling in one of her toes. She was on vacation in early 2008 when the pain and spasms in her back became excruciating and she was advised to get a MRI of her lower back. After the results were read, she was asked to come back and have an MRI of her brain and spine. She was sent to a neurosurgeon. The MRI revealed multiple tumors in her cervical, thoracic and lumbar regions - most being described as the size of granules of sugar. He thought the tumors were anaplastic ependymal tumors and suggested she have surgery. The cervical and thoracic tumors were centimeters larger and more worrisome. She had her first laminectomy surgery in March of 2008. The surgery was about six hours and the surgeon removed as much of the tumor as possible but she had far too many to retrieve them all. She went to a skilled nursing facility for rehab for about a week before the spasms in her back became unbearable. She was sent back to the hospital in April for a second laminectomy in the lumbar area. She began rehab again at the nursing facility and then was sent to a hospital for a more aggressive rehabilitation. She began walking with a walker and after about two weeks, she was discharged and sent home. In June, she lost the ability to stand and loss of feeling. Michelle went back to the surgeon and was scheduled for her third laminectomy and second surgery in the thoracic area. When she recovered from surgery, she was not able to stand again. She was diagnosed with an incomplete spinal cord injury and was a paraplegic from T-10 to S-1 (unable to move from her chest down). She can feel certain spots in her chest and abdomen as well as pressure and hot and cold in her lower body. She had 32 sessions of radiation in her spinal cord and target radiation in her brain. The radiation left her with a short-term memory deficit. She continued living in California until it was not sustainable for her. She moved to Florida with her father and I and started visiting a neuro-oncologist in Gainesville from 2009 to 2014. They monitored her condition with MRI's and physical therapy. Being a teaching hospital, her neuro-oncologist transferred to another hospital and that left the hospital with no neuro-oncologists who treat adults. We started to seek out another doctor and were put in contact with neuro-oncologist and CERN member, Dr. Jing Wu, who was at North Carolina. Dr. Wu agreed to monitor her MRI scans that were sent by a hematology oncologist from the University of Florida. At one point, she saw the tumors were becoming more aggressive and we met again and decided that intervention was mandatory. With the help of Dr. Wu, we selected a local neuro-oncologist from Orlando. 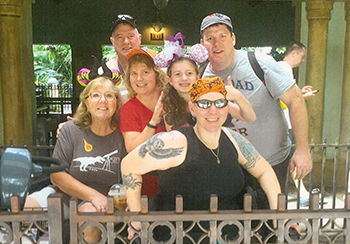 Michelle began taking Carboplatin and Bevacizumab alternating weeks in February of 2015. This worked for a short time until July of 2015 when her MRI showed the tumors were still growing. It was determined by our doctor that we needed to change the chemotherapy treatment. Michelle started taking Etoposide and Avastin every two weeks. Although Michelle stays in the hospital each time she receives Avastin, the staff is wonderful and treats her with great respect. The next MRI revealed the tumors were stable and has remained that way since July of 2016. Her doctor has decided that it is best to keep Michelle on this regimen for an indefinite period, followed by MRI's every three months. Michelle continues to go to the gym and work out with a personal trainer to maintain her upper body strength. She enjoys archery, puzzles, games, nature and likes to sit outside and read. We travel across the country in our RV, where she finds great pleasure in viewing the sights. She has her sad moments and we are going to explore visiting a therapist to talk out her feelings of sadness and find better coping methods. Her friends are very important to her and she keeps in touch with some childhood friends and her trainer has become a great confidant. My advice for others would be to keep your hopes up, your attitude positive and your weight down. Through it all, she remains positive with a great spirit and attitude. She is my hero.